The path from grassroots campaign to national model for the No Kill movement. PAWS Chicago was founded with a single aspiration. One by one, we can mobilize people to help homeless animals. And, one by one, we can save pets at risk of euthanasia. But first, people needed to know the truth about the mass-scale killing of homeless pets. In 1996, there was no public consciousness about these animals. People were not aware of pet overpopulation. They certainly did not know the vast majority of homeless animals were being killed. PAWS founders Paula and Alexis Fasseas’ awareness moment only came after they rescued a stray dog they named Pippen from the Greek island of Crete in June 1996. Pippen would have been poisoned once tourist season ended. The Fasseas family was shocked Greece would treat its animals with such cruelty. Pippen’s story inspired Alexis to help homeless pets back home. As a high school sophomore, Alexis signed up to volunteer at a local animal shelter to fulfill her community service requirement. She was shocked when she learned that instead of saving pets, the shelter was replacing basic medical care with euthanasia. A simple sneeze was a death sentence. Over the next two years, Paula and Alexis saw the terrible story of mass euthanasia of cats and dogs repeatedly. First, when they visited the city pound (Animal Care & Control) for the first time. Again, through a May 1997 Chicago Sun-Times article that revealed more than 40,000 pets in Chicago were being killed each year. This has culminated into a collective action that has had transformative results, with the killing in Chicago declining by more than 87% since PAWS Chicago’s founding. 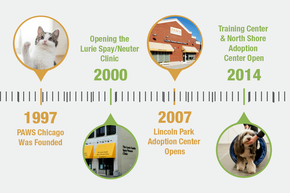 Visit the Milestones to read more about each step of PAWS Chicago’s journey. Check out how we've been making a difference since 1997.